Do you ever accidentally forget how you’re truly supposed to be living? 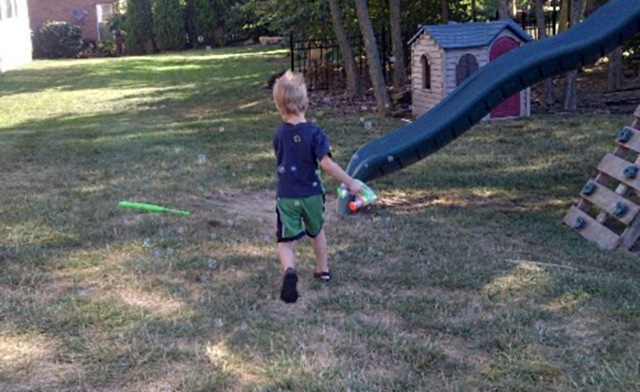 In case it’s not clear, that’s The Attitude, running through the yard, surrounded by bubbles. And if you’re not imagining that being you right now, or at least wishing for a brief opportunity be so carefree, well, I’m afraid you might be dead inside. Seek professional help. Now, here’s today’s homework: figure out what your bubbles are. Go chase them. Giggle. Fall down. Repeat. I concur here, also. Both you and Amy should use this as your FB profile pic. Too precious for words!!!! When you get to be our age you wonder sometimes if you were ever that carefree! And of course, when you are that age and that carefree, you’re too young to truly get it!!! !